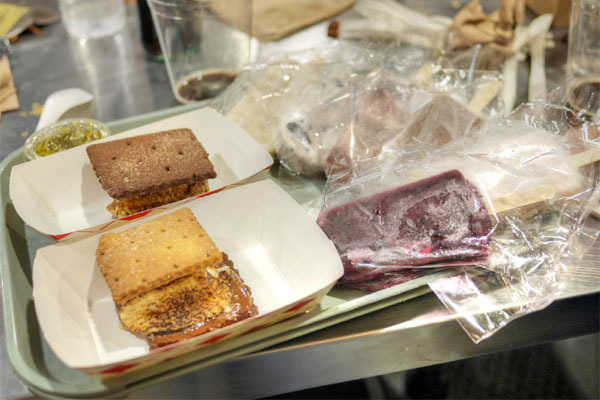 Jason Quinn of Playground fame is continuing his dominance of the Downtown Santa Ana dining scene with Lunchbox, a three-in-one lunch-and-dinner concept situated at DTSA's 4th Street Market. 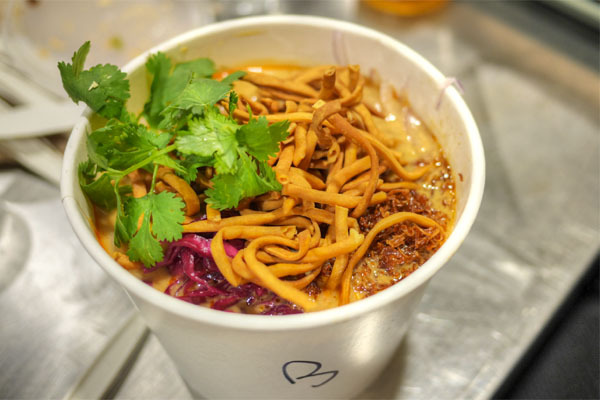 Lunchbox debuted back in February, and is composed of a food stall trio--burger joint Wagyu Chuck, fried chicken joint PFC, and khao soi joint Noodle Tramp--as well as an adjacent bar and retail shop. Above, we see the individual menus for the three Lunchbox restaurants. Note, however, that you can actually order any dish from any one of the stalls. Click for larger versions. I'm not sure if BYOB is allowed here, but I went ahead and brought some bottles anyway (the setup here makes it quite easy). 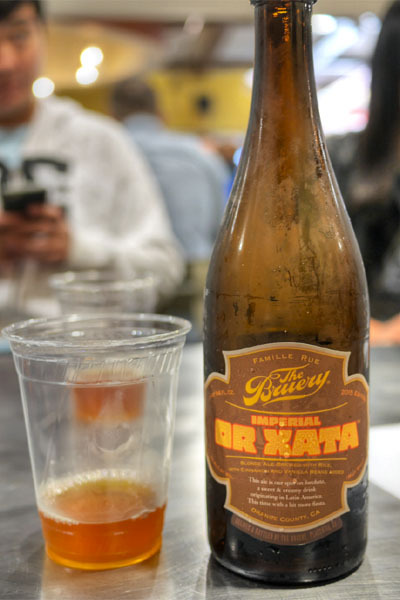 Up first was the newly-released 2015 The Bruery Imperial Or Xata, a blonde ale made with rice, lactose, cinnamon, and vanilla beans, basically the brewery's take on horchata. 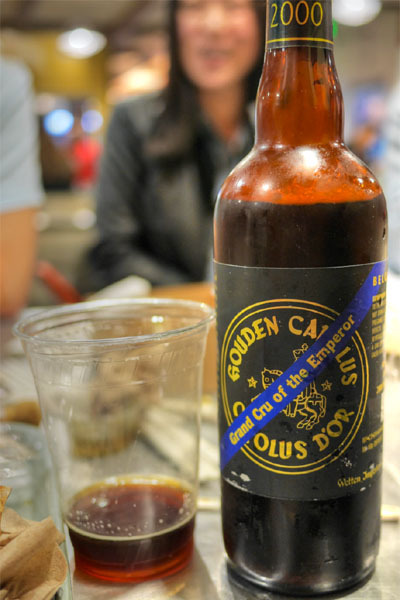 If you recall, I had the regular version of the beer at Pok Pok Phat Thai a while back. This Reserve Society-exclusive "imperial" version was brewed with more malt and more spice, making for a noticeably more satisfying beer. It was creamier, richer overall, with a great base of rice-y flavors accented by delicious sweet spice. 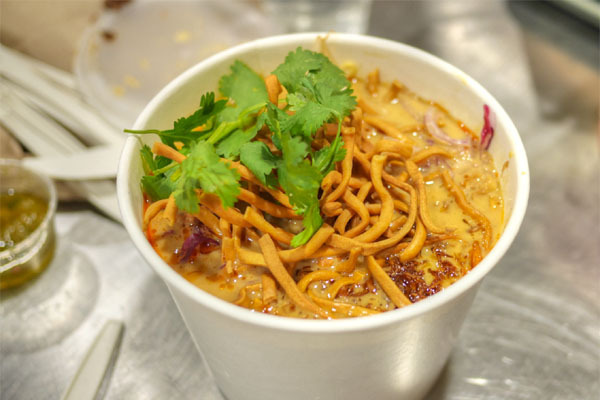 Let's kick things off with Noodle Tramp's beef khao soi, a type of noodle soup popular in the northern part of Thailand and Laos. It's a dish that I first fell in love with at Norwalk's Renu Nakorn, and Quinn's version was a worthwhile homage to this little known classic, comprising boiled and fried egg noodle, peanuts, fried shallots, red onion, pickled cabbage, bean sprouts, cilantro, and lime, all in a coconut curry broth. The beef itself came thin-sliced, tender, and appropriately beefy, a tasty pairing to the heady flavors of the coconut-rich broth while the various veggies imparted the necessary lightness and brightness to the soup. Great textures, too. 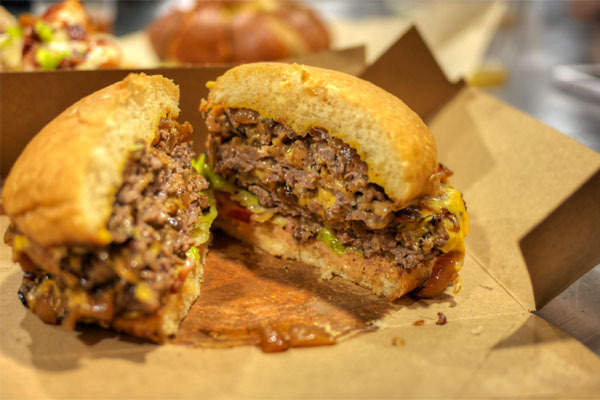 Moving on now to Wagyu Chuck, here we see Quinn's take on an In-N-Out-style burger, made, unsurprisingly, with house-ground wagyu chuck, as well as a sponge dough bun from the Chef's bakery Dough Exchange. 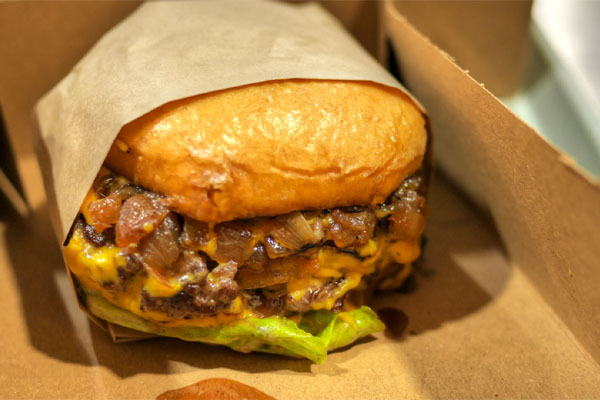 It was a damn fine burger, just trashy enough and with a delectable balance of beef, char, cheese, and onion that made for some deeper, more robust flavors compared to its fast food inspiration. 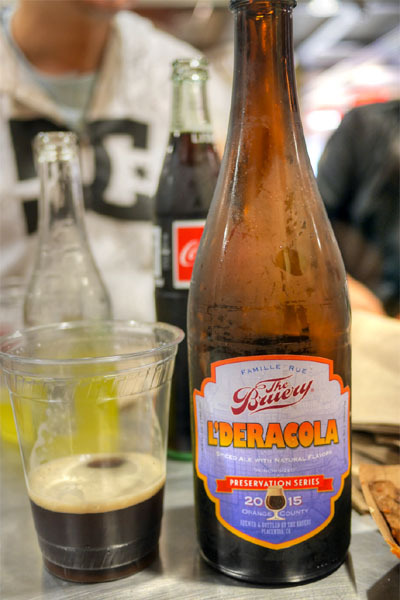 Another new release was the 2015 The Bruery L'deracola, a dark ale brewed with spices and lime that's meant to mimic the flavors of cola. It was pretty good actually, a real pleasant surprise. They did a great job conveying the essence of the soda, presenting all the mouth-tingling spicy aspects of the drink, but without all the associated sugar. I appreciated how the beer captured the light, effervescent mouthfeel of cola to boot. 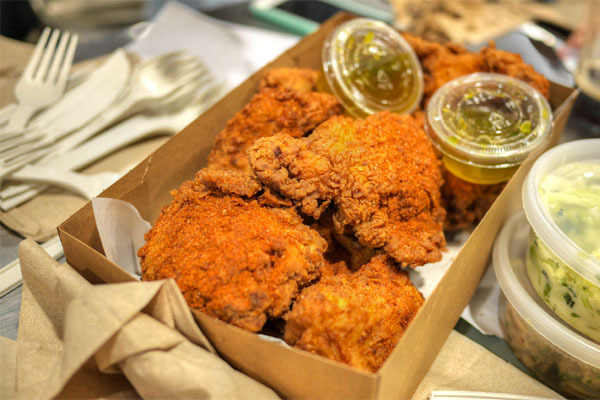 Playground Fried Chicken is not the same as the Uncle Lou's fried chicken typically served at Playground. Instead of the vinegariness of that preparation, the bird here is dusted with Southwestern-ish seasoning, giving things a sweet spice. It makes for a fitting pairing with the crispy, juicy chicken, and I liked it even more with a dip in the accompanying lime/agave/jalapeño sauce. 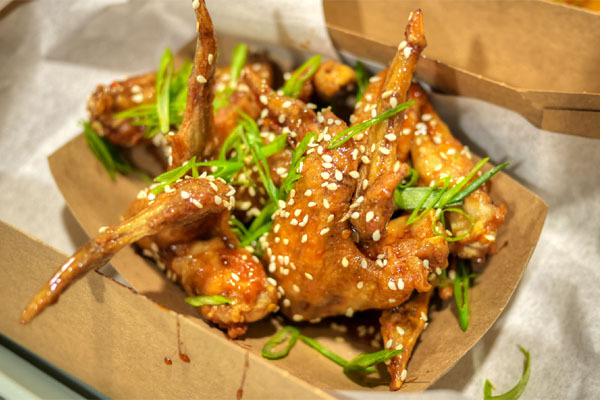 I don't quite get the name behind these wings from Noodle Tramp, but they were tasty enough, crunchy examples with some deep umami flavors joined by just a bit of sweetness. Here we have Recess, a bar by Playground that offers up six beers, six wines, and six cocktails, all on tap, in addition to a selection of house-made sodas. Running the program here, unsurprisingly, is Playground Beverage Director Jarred Dooley. Hearty chunks of baked potato formed a perfect base for Wagyu Chuck's well-spiced chili, beautifully accented by the sprinklings of cheese and onion up top. 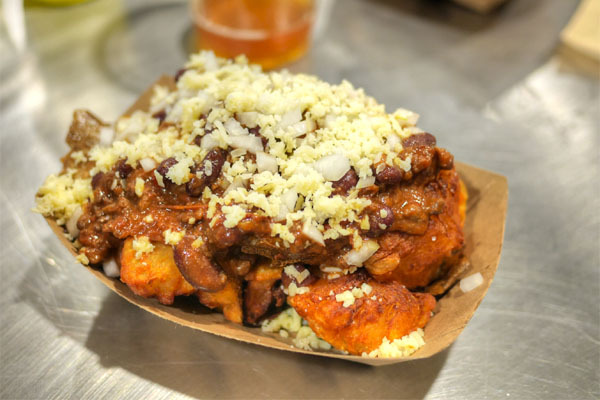 A delectable take on your classic chili fries. 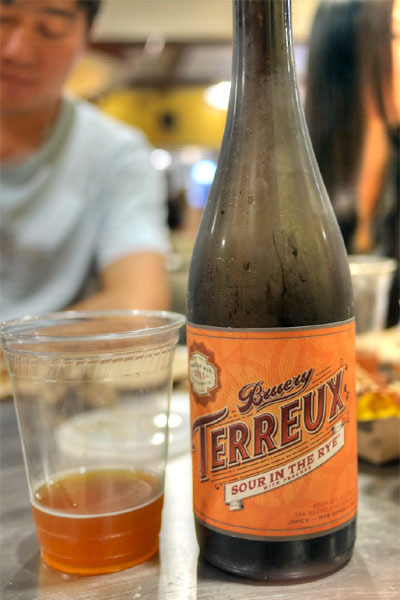 My third and final Bruery beer was the Reserve-only 2015 Bruery Terreux Sour in the Rye with Peaches, a sour rye ale aged a year in oak barrels, with local peaches added. The fruit was subtle on this one. Rather, I got a lot of rustic, farmhouse, tart flavors commingled with rye spice, the juicy peaches coming through more toward the close. 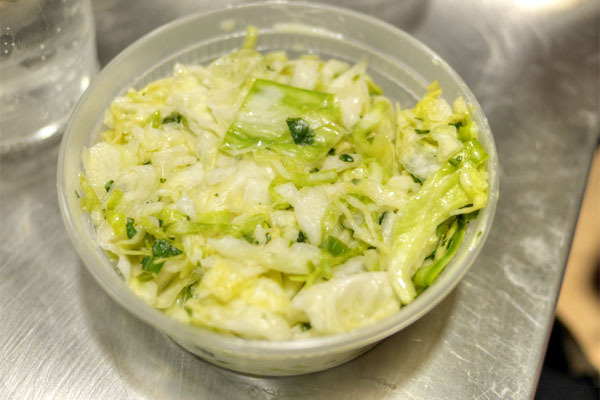 PFC's slaw was light and bright, with a nice crunch from what I believe were bell peppers. The chicken version of Noodle Tramp's khao soi was a touch sweeter it seemed, with the tender, hearty chunks of bird well-matched to the disparate tastes and textures present, the bean sprouts working particularly well here. 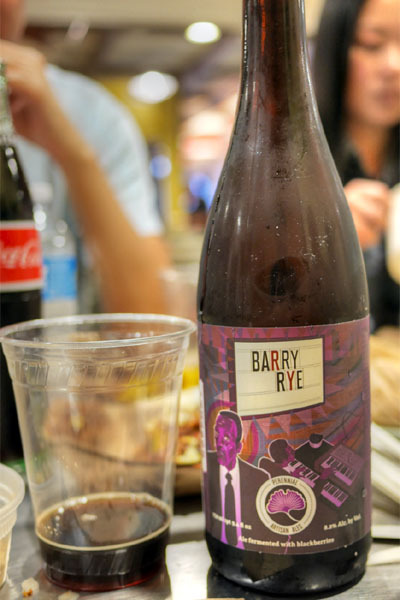 Following was another rye beer, the 2013 Perennial Barry Rye, fermented with blackberries. Again, the tangy spice of the rye was the star here, with an undercurrent of dark fruit peeking through only occasionally. 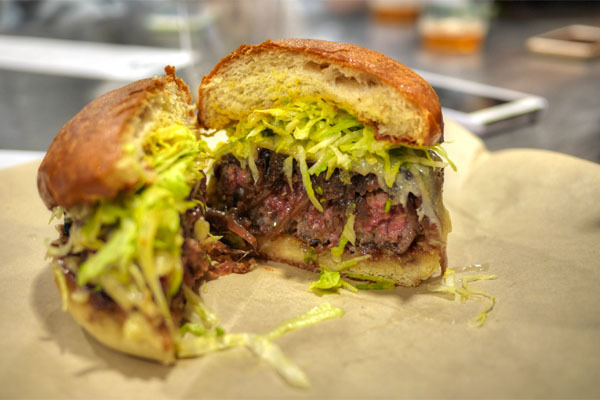 And now we come to the signature Playground Burger, a "secret" menu item at Wagyu Chuck. 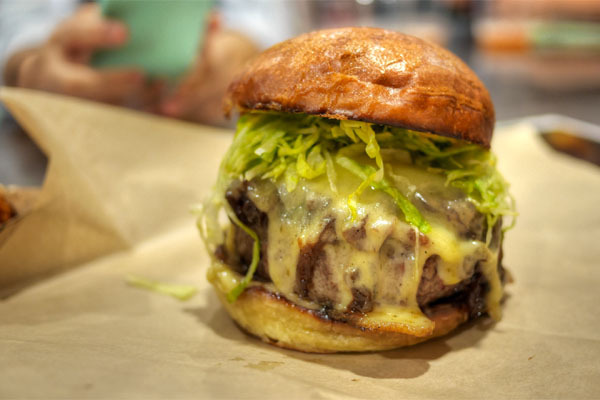 I'd had it before, and it still stands as one of my favorites of all time: a thick puck of wagyu-Angus blend, cooked suitably rare, Fontina and Gruyère cheeses, maple-bourbon caramelized onions, and iceberg, all dressed with a delightfully tangy mustard-mayo. It was a rich, robust, pure expression of beef, and as good as the standard Wagyu Chuck burger was, this one clearly surpassed it. 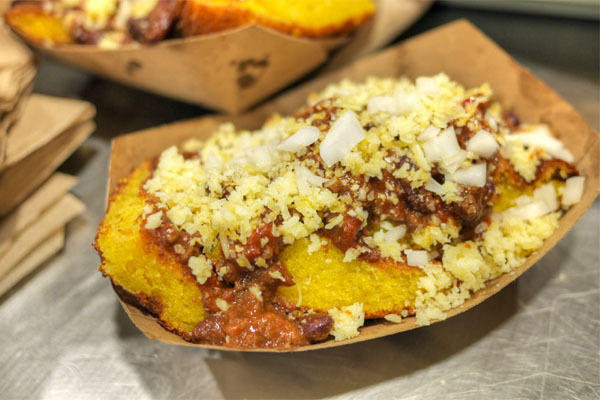 Cornbread is made daily at Dough Exchange as well, and came out wonderfully textured and just sweet enough. The chili worked well enough here, though I much preferred it on the potatoes above. With my next beer, the 2000 Brouwerij Het Anker Cuvée Van De Keizer Blauw, I took things back, way back. A 15-year-old Belgian dark ale, this one showed its age, tasting almost of sherry with its mix of dark fruit and oxidative qualities. 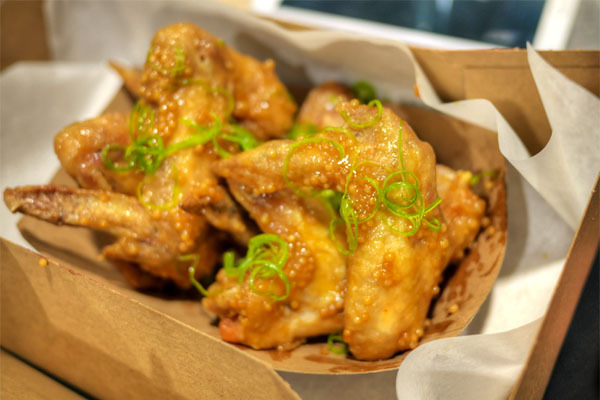 Noodle Tramp's mustard wings came out just as crisp as their "Bloody" brethren, and definitely lived up to the mustard part. 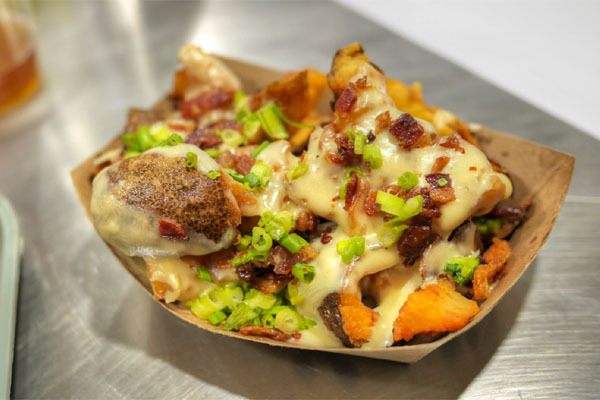 As good as the chili potato fries above were, these were even better, an utterly satisfying combination of cheese, bacon, and scallion that gratified in a base sort of way. 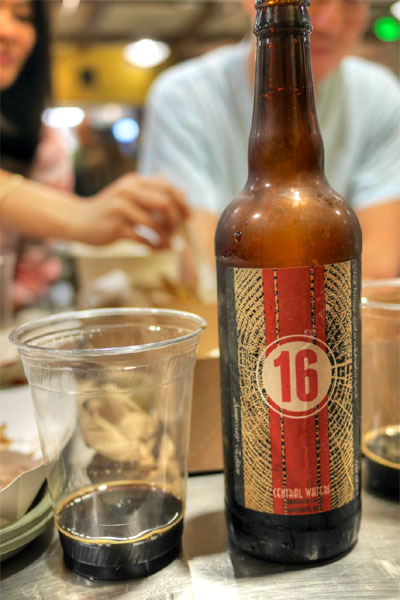 The sole stout of the night was the 21-month bourbon barrel-aged 2013 Central Waters Sixteen, brewed to commemorate the brewery's 16th anniversary. I didn't find this one particularly impressive. I got pretty much your typical roasty, chocolate flavors, with a decent amount of boozy bourbon character and not much else. 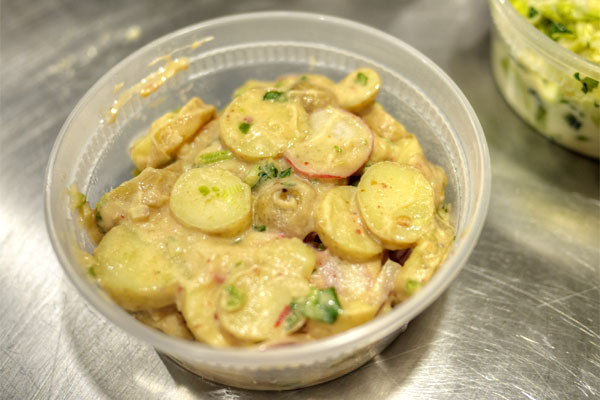 PFC's potato salad was a nice change of pace, a creamy, herby example with a punchiness from the chipotle. 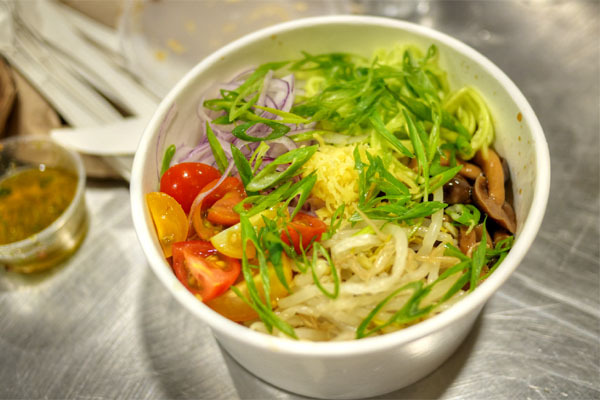 A seasonal special at Noodle Tramp was this cold ramen dish with cucumbers, red onion, tomatoes, pickled ginger, beech mushrooms, bean sprouts, and scallions, all dressed with yuzu/soy/honey. It was a cool, refreshing, summer-y sort of noodle dish, with some bold, bright, zesty flavors underpinned by a persistent bitterness. 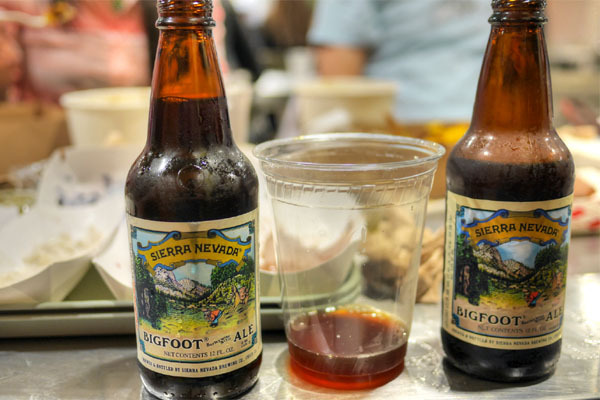 Last to drink were the 1997 & 2006 Sierra Nevada Bigfoot Barleywines. They key here was to compare and contrast the two. I started with the younger beer, which had a distinct cherried note on the nose, while taste-wise, I got plenty of malt and chocolate, with a distinct hoppy finish. I preferred the '97 though, which had an even sweeter bouquet, and tasted more of dark fruit, but with still a tinge of bitterness. For dessert, we headed over to Torch S'More Co and Front Porch Pops and purchased this spread. And that wasn't even enough. Chunk 'n Chip was next. Satiated, we wandered over to Honor Roll, the schmancy retail shop also run by the folks at Playground. In addition to selling a variety of artisanal-type products, it's also home to Electric City Butcher and the storefront for Dough Exchange. We had a fun time at Lunchbox, which serves as a key anchor for the burgeoning 4th Street Market. 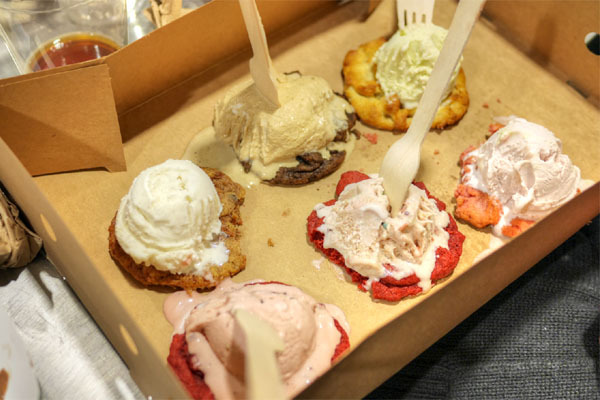 The food provides a casual taste of what's available at Playground proper, and in fact, if any of the adjacent eateries should fold, it might be fun to have Quinn and company introduce even more specialist stalls to the space: Pasta bar? A lobster roll spot? Fish and chips? Bánh mì? The possibilities are endless. Well if you're making a trip out of it, you should probably hit up Playground proper first.